It’s well past midnight, and I can see my breath as I burrow into my -20 degree rated sleeping bag. Surrounded on all sides by solid ice, the temperature dips into the low 20s and I tighten the bag’s drawstring—cocooning myself inside—and wonder what I’ve gotten myself into. 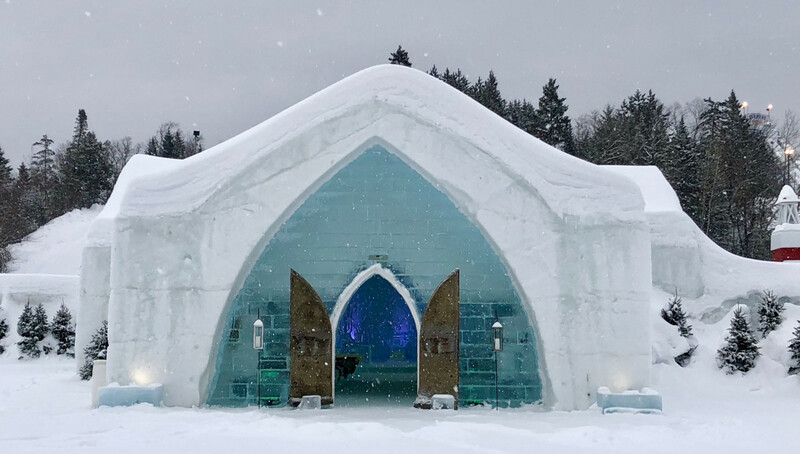 This is the Hôtel de Glace, North America’s only ice hotel, located just outside Québec City, Canada on the grounds of the sprawling Village Vacances Valcartier. My friend Melissa and I are here to do what many wouldn’t—spend the night inside this frozen palace, which is built every December and open just January to March. While the old world vibe of Québec City enchants year-round, this French Canadian capital bustles in summer, but quiets during winter’s chill. Here European-style cobblestone streets, authentically French croissants, and intact city walls dating from the 1700s, contrast with unparalleled winter thrills, all less than 20 minutes from the city. For those seeking fun outside without the crowds, the Canadian province of Québec shows its best self when snow blankets the ground. From ice sculptures dotting the city to a frozen hotel and ice climbing just beyond its borders, winter activities abound, enticing visitors to escape the indoors and embrace the cold. 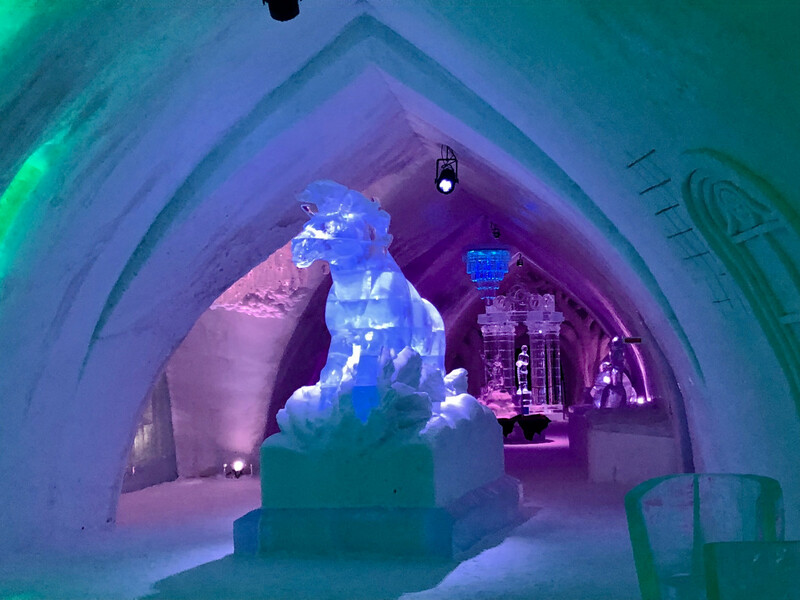 Beyond the unique experience of sleeping inside a giant ice cube, the Hôtel de Glace is an architectural wonder. Constructed with high Gothic archways and towering ice sculptures, the annually changing theme makes every visit a new one. This year’s Babylon garden concept brings flower motif walls, ice-carved peacocks, and larger-than-life ice-sculpted horses and flying snow owls to the space. This rendition is also the largest to date, stretching 42,000 square feet—40% larger than last year—and attracting 100,000 visitors each year. 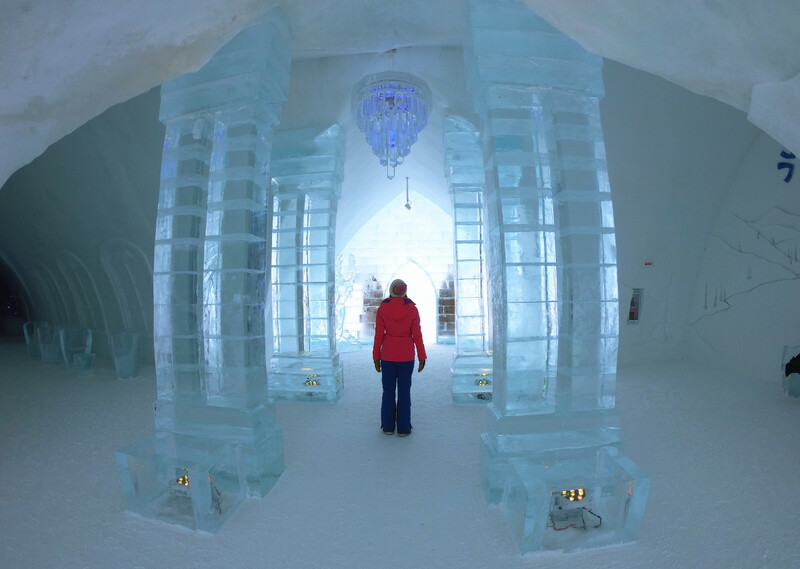 Ice-obsessed brides can even walk down the aisle in the all-ice chapel. And while day visitors can amble the hallways, ride the ice slide, and sip a cocktail in a cup made of ice, only night visitors get an all-access pass behind the curtain to sleep in one of 42 suites. Ours, carved by a Quebecois artist, features intricate lilies, a floral ice headboard, and a showpiece fireplace that uniquely gives off no heat. (It is an ice hotel after all.) Nightstands here are purely decorative. Dare to leave your eyeglasses out and you’ll find them frozen solid to it by morning. And staying warm is no joke, training is mandatory before even going to your room. Here we learn that less is more when it comes to sleeping, and choose our lightest long underwear for our bedtime wear. And after first upping our body temperature at the outdoor sauna and hot tubs, we attempt the difficult dance of climbing inside our arctic-ready sleeping bags, stuffing our clothing at the bottom to prevent freezing. Due to ice’s insulating properties, once inside our bags the hotel is eerily silent--even though curtains substitute as doors--and I quickly drift into an icy dreamland. Melissa soon ventured back indoors, but snuggled in my sleeping bag, I sleep until an attendant rouses me from sleep via a wake-up call from beyond the curtain. Once I free myself from my warm bag, the sudden cold has me dashing for the door. And though I’m no polar explorer yet, I reward myself for surviving in the most ice hotel way possible: with one last dash down the carved ice slide. “Animal! Kick! Kick! Kick!” our guide, legendary mountaineer François Guy Thivierge shouts, encouraging me as I swing my ice axe, connecting with frozen water and using my crampon-clad feet to climb up, up, up. Once we’ve slept inside ice, it’s time for a day atop it. 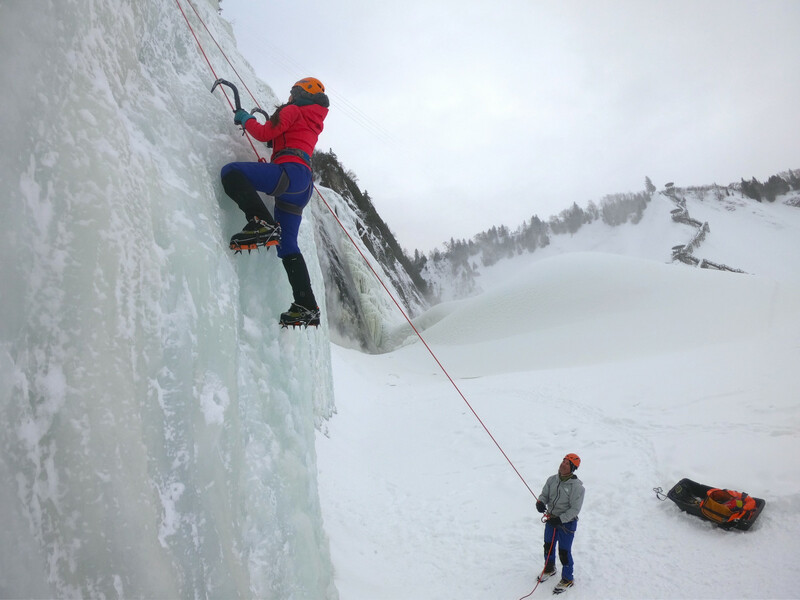 As an acrophobe, I’ve long dodged ice climbing opportunities, but quickly realize the fun I’ve been missing. Sure, my hands are numb, but there’s something uniquely satisfying about smashing ice, pushing yourself to climb far beyond what your mind wills. 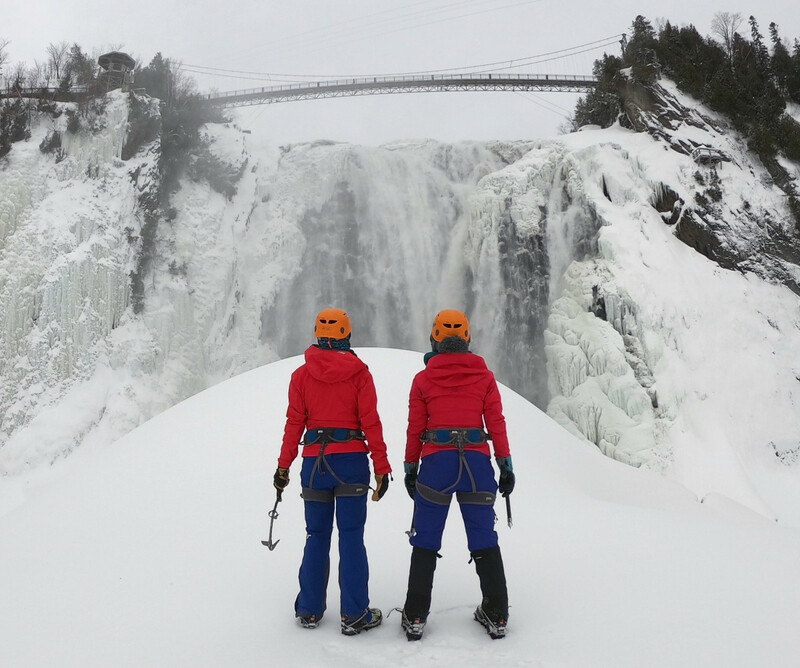 And here at Quebec City’s Montmorency Falls, world-class climbing is just 15 minutes from the city, but feels a world apart. Stretching 272 feet above us, Montmorency towers higher than Niagara Falls and flows freely year-round, At its base is the pain de sucre, or Sugarloaf, a unique mound formed by Montmorency Falls’ water pummeling down, evaporating, immediately freezing, then falling to the ground as white powder. Sugarloaf can grow to 100 feet in a cold winter! From our adjacent climbing spot, I can see the falls as I swing and step my way up. As I go I forget the height, forget the fear, and let my ice axe lead meto the top. Once there, I simple stare out and marvel at Canada’s spectacular winterscape before rappelling back to the frozen Earth below. Once our arctic adventures end, we warm up the Quebecois way at a spa Nordique. From Norway to Iceland to Canada, northern nations have the right idea about apres. Here, people around the world see spa culture not as an indulgence, but a way of life. But, it’s not just about relaxing in a tub; Québec’s Nordic spas are designed as a therapeutic treatment, taken in a specific order. “Start with the thermal river,” our attendant says at Strøm Spa in Old Québec City. “It will acclimate you and transport you outside before you visit the warmer pools.” We follow her advice and wade into a what’s best described as a waterpark-style lazy river—minus the inner tubes and small children. As couples lounge on chairs, we drift floating through the building and out under the stars. Bubbling waters push us toward outdoor pools perched above the mighty St. Lawrence River; below the moon lights up frozen ice chunks floating down the bustling waterway. 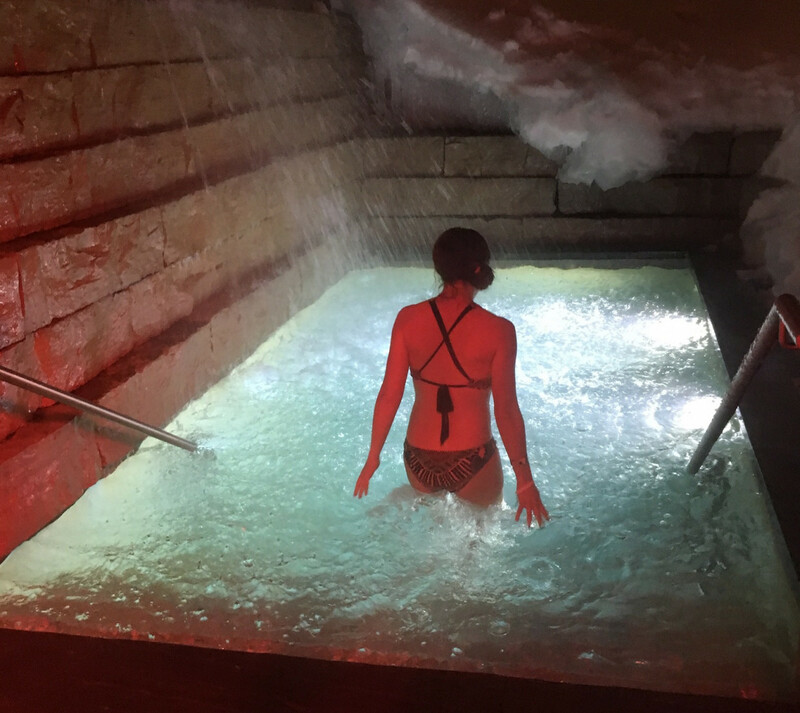 We follow the spa circuit, soaking in sizzling pools and underneath thermal waterfalls, until taking the prescribed 15-second plunge into arctic waters—with the promise of reduced inflammation and rejuvenation afterward. Salt scrubs and eucalyptus steam follow, soothing our windburned skin, repeating the hot-cold cycle until peak relaxation is achieved. The perfect end to an ice-cation. Whether you’re typically a winter fan or are a beach goer looking for a change, Quebec’s polar paradise makes it worth ditching your swimsuit for snowboots and venturing into the Great White North.